The glimpse below provides a short introduction to the CCC program and its importance to Letchworth Park. 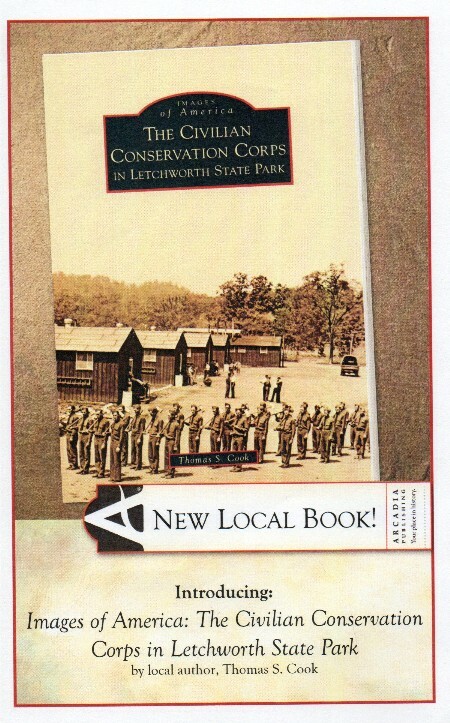 For a more detailed look at the Letchworth CCC experience and legacy, pick up a copy of "The Civilian Conservation Corps in Letchworth Park." The book is available in the Park, from internet retailers and from the author. In the spring of 1933 the United States was mired in a deepen depression. A new president, Franklin D. Roosevelt, had just taken office, elected on the promise of bringing a "New Deal" to Americans. One of his early programs was perhaps his most successful - the Civilian Conservation Corps. The CCC was created on March 31, 1933 when President Roosevelt signed the Emergency Conservation Work Act. As he had told Congress, the goals of the new program were the "relieving the acute condition of widespread distress and unemployment...the restoration of the the country's depleted natural resources and the advancement of an orderly program of useful public works...."
By July 4, 1933 250,000 unemployed young men had enrolled in the program. By the time the last CCC camp closed in 1942, nearly 3.5 million had enrolled in the program. It is estimated that over 3,000 enrollees served at the Letchworth Camps between 1933 and 1941. The Park was the perfect place to operate the camps. One criterion for camp establishment was availability of raw material -- thus Letchworth park was equipped with a sawmill and various stone quarries so the natural resources on site could be utilized. The chestnut blight had just devastated the forests of the east and salvage timber was everywhere. There were plenty of possible projects, especially since the Park had recently expanded northward from Wolf Creek and there was a growing public demand for facilities such as cabins, picnic areas, and recreational trails. These camps were run by both military and civilian personnel. The organization and operation of the camp itself fell under the army, while the work projects were designed and approved through the Genesee State Park Region, National Park Service, and the Department of the interior. Visit the Lower Falls area and in front of the South Pool you will find a monument to commemorate the work of the CCC. 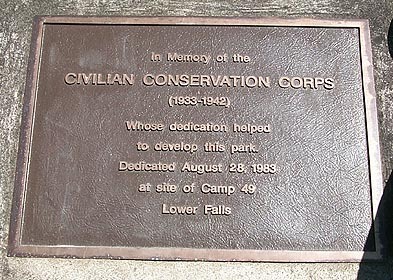 (Shown above) This was dedicated by Parks Commissioner Orin Lehman at a special dedication ceremony in 1981 to note the 50th anniversary of the CCC. A CCC alumni group was formed and reunions were held annually until 2014. The Park, with the help of the Friends of Letchworth Park, will continue to hold a CCC Recognition Day each summer. The CCC Alumni and the Friends of Letchworth Park worked with the Park to erect a A CCC statue on the grounds of the Lower Falls Camp in 2003. A museum exhibit and interpretive signage at all the camp sites help visits understand and appreciate the CCC experience and legacy. Subsequent youth employment programs were instituted by the Federal and State governments but none achieved the level of productivity of the CCC. The Civilian Conservation Corps was and will always remain a significant part of the story of Letchworth State Park.